Two trays measuring 5.62" x 12"
And one tray measuring 4.12" x 12"
Sterilization is one of our primarily specializations, and we would love to have the opportunity of helping you determine your best sterilizer solution. NOTE TO DENTISTS: We are not authorized to sell to dentists. No exceptions. Sorry! The Ritter M7: Small, Fast, Sturdy! The Ritter M7 Speedclave is one of the most popular solutions for quick sterilization of small loads of instruments. Like the 1730 by Tuttnauer, the Ritter M7 is small, fast, durable, but only comes as a manual sterilizer (meaning easy to operate, but no drying cycle, no automatic door). TheRitter M7 is a manual sterilizer, meaning that it lacks the automated features you would find in, for example, the automatic Ritter M9 or Ritter M11, or the Tuttnauer EZ9 or EZ10. 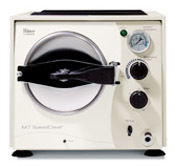 Small manual sterilizers like the M7 will complete your instruments in about 9 to 12 minutes, but you will need to vent the system and remove the instruments to dry. This is why, as with all manual systems, you are going to want to probably use instrument pouches, which enable you to remove your instruments from the chamber and handle them (in their pouches) without contaminating them. Call now: 800-839-0722 or submit the short form at the top of the page for an instant quotation. Family owned and operated for over 25 years, Fisher Biomedical specializes in consulting with clients on their sterilization needs, having worked with medical, dental, and opthalmological offices, surgery centers and hospitals, veterinary practices, colleges and universities, government agencies and military installations, everything from small med spas up through major institutions and manufacturing laboratories — across the USA.